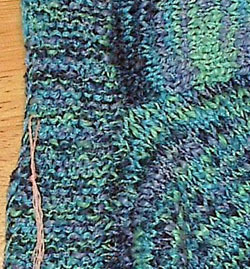 The grafted seam that started the whole ‘what makes an advanced knitter?' thought process. If you can't find it, the pink string marks it. It's a zombie knitting project. I recently had occasion to graft a seam in garter stitch. After the third try, when I had it right, I was admiring it and suddenly thought: "I wonder if beginner knitters think we already know this stuff?" I've been knitting nearly twenty years now, and I don't think anyone argues about whether I'm considered "advanced", and yet I'd never needed to graft a seam in garter stitch before. When I did, I sat down and figured out how to do it. Do beginner knitters have this idea that advanced knitters have a great, mystical overview of the art? Are we supposed to know everything? Because let me tell ya. We don't. As far as I can tell, the only difference between "beginner" and "advanced" is that advanced knitters have a more devil-may-care attitude toward trying new things. In trying new things, we learn new stuff. Funny how that works. So the knitting maniacs of the world move on to advanced status, cavalierly adding pockets where we want, knitting gloves and socks, putting swathes of color all over, and otherwise biting off more than we can chew and figuring it out as we go. I'm sure this says something about the personality of some knitters. I'm not sure it's good, but there it is. Some of us are just nuts and will try anything once. We're shameless. A lot of us probably bungee jump and get into bar fights, too. Some beginner knitters are more than content to make scarves and simple sweaters, and to you I say keep right on. The whole point of this exercise is to enjoy ourselves, and if you are, then you're doing it right. But for those of you who want to expand, experiment, or have an urge to bungee jump, you've come to the right article. I learned to knit in the Dark Ages. (That would be the 1980s.) At the time, it was nearly impossible to find a good local yarn shop and the internet didn't exist to help locate national catalogue suppliers. You were stuck with what you could find at KMart, or paying truly obscene amounts of money for average yarn. At the time, I didn't know anyone else who knit, and so I had no one to tell me anything was difficult. After hitting the local library, I found some old lace patterns, got some #10 crochet cotton and size two double-point needles, and started figuring out how to knit lace medallions. And that's what I did for 10 years. Boring? Less than you'd think. Although I did occasionally wish I could knit something to wear< . But you know what? Once I finally found a source for decent yarn (thank you, Patternworks) and I sat down to knit myself a sweater…well, shoot, those sweater patterns looked downright easy! The first of my off road knitting projects, adapted from Elizabeth Zimmermann's Chain Mail pullover. This is the first color knitting I ever did. Check out the neck and sleeve decreasing. 1. It doesn't have to be expensive. For crying out loud, no matter what you do, keep the cost of a learning project as low as possible. Nothing will make you choke faster than knowing you're in the process of destroying $500 worth of cashmere. I once made up a simple pattern for some 100% silk roving yarn and nearly had a nervous breakdown-- and that was after I knew what I was doing. If you see something new and exciting and you have < to knit it, fine. Knit something similar first, so you can learn the skills. Then blow the big bucks. This is one reason I suggest fooling around with lace medallion knitting [see below]. Even if you never finish the thing, you're only out a spool or two of thread. They run about $2.50 each. This is no big deal. Brown Sheep makes affordable wool yarn, and Reynolds makes some nice cotton and lopi, also reasonably priced. Take advantage of it. Or knit a miniature version of the project you want to do, and make a kid you know very happy. 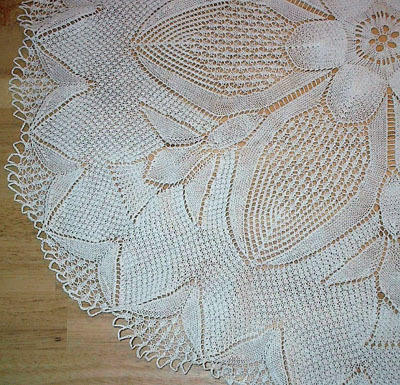 The only lace medallion that I ever kept. 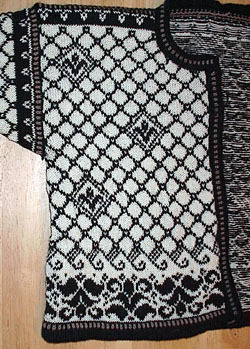 The pattern is available in The Second Book of Modern Lace Knitting . 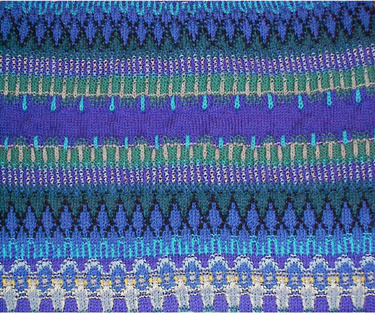 There's nothing in this pattern but knit, decrease, increase, and yarn over. But you might want to start with something smaller. Amazon.com has The First Book of Modern Lace Knitting and The Second Book of Modern Lace Knitting, both by Marianne Kinzel, available for around ten bucks each. These are great books because you get two versions of each pattern-- one written out and one charted. If you can't read charts, you can teach yourself that, too. There are directions in the front for specialized cast ons and bind offs. Particularly for color knitting, which can be pretty involved, pick something that you think is the coolest damn thing you ever saw. You're going to be looking at it for a while. The ubiquitous Dale Cardigan. Those steeks are crocheted. Learn something new every day. 4. Keep two projects going at once. Not literally at once, but have two to choose from. I call mine "The Epic" and "Zombie Knitting". Epic projects usually involve color (the one I'm doing now has twelve), weird shaping, lace, cables, or something I've never done before. It's a challenge and you have to pay attention to it. Zombie knitting means standard, one-color, stockinette projects like sweatshirts and other things I do really, really well. This way, when I get frustrated or stalled with an Epic, I can take a Zombie project to the movies with me and zone out. And feel like I'm accomplishing something. I finish one or two Epics and eight to ten Zombies every year. That's another reason for two projects-- learning isn't always a quick thing. 5. Quit shooting yourself in the foot. Do not look at projects and say "I couldn't do that." Look at them and say "How did they do that?" People look at lace knitting and freak out. Know what? All it is is knitting, purling, decreasing, and yarn overs. Whoopee. Anyone can do that. Same with stranded color knitting; you carry two yarns and knit with the color you want. It's knitting, for crying out loud, not brain surgery. Quit spazzing, get some needles, and try it. 6. Know you're going to get better. When you finish a project and look at it, thinking, "I wish I'd done the sleeve caps differently, and fixed the collar, and added pockets, and..." this does not< mean you failed. It means you learned something. While knitting a Dale of Norway kit a year ago, I encountered Meg Swansen's crocheted steek (see Knitting from Camp or Meg Swansen's Knitting-- the crocheted steek is the coolest thing since chocolate). And now I wish I could go back and fix the un-crocheted steeks in everything I ever knit. But my other sweaters aren't failures or bad; it just means my next ones will be even better. This is cause for celebration, people. 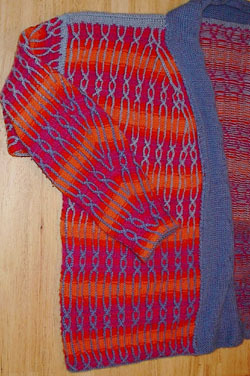 Detail from the current Epic Knitting project, as yet unfinished. The education goes on. And on. And on. 7. It's okay to hate something. I can do intarsia knitting, but I hate it. And I hate all these new novelty yarns; the weight of them bothers my hands and I go blind trying to figure out where the stitches are in all that fuzz. My answer to this is to not do intarsia or use novelty yarns. But the point here is I tried it first and then decided I didn't like it. It's like broccoli. Give it a try before you decide you can't or won't do it. If there's something you've always wanted to try, please, go try it. None of these skills are difficult, just slightly different from each other. All it really takes is sitting down and figuring it out. If you can knit at all, you can learn the rest of these skills. No knitter ever had a revelation from on high; we all had to sit down, knit, rip, knit, rip, and figure it out for ourselves. There's not a thing in the world stopping you from doing it too. So go! Cast on something you thought was too hard for you! It's safer than bungee jumping. And when people ask you if you're an advanced knitter, you say, "Why, no. I'm a maniac." Julie Theaker doesn't know where she lives at the moment. When she isn’t knitting, reading, or writing, she takes classes on botany and anthropology at whatever school will admit her. Text and images © 2004 Julie Theaker. Contact Julie.